After a short brake on this side, I'm here to show you my last card for Copic Spain, which includes also a step by step tutorial on how to colour this cute kitten. 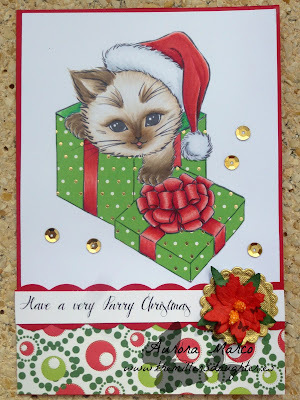 For this card, I used the sketch of a tutorial made by Cristina Valenzuela, for a new Facebook group, Card Making in Spain. In this card: Stamp by Aurora Wings. Colouring details and step by step tutorial here. Cute holiday card, thanks for sharing with Simply Papercraft! This is stunning! I love the image and the simple yet elegant layout. Thanks for joining us at Love to Scrap. Very cute, image is adorable, perfect colorign. Truly a fun sweet card. Thanks for joining us for our 'Anything Goes' challenge #40. And for entering our C.R.A.F.T. Challenge too!